In case you haven’t heard, the RIAA soon turned to strong-arming consumers once they had extorted all they could from the file sharing software companies. The fact of the matter is that they are resisting technology. People want music in a new way. They don’t want it bogged down by Digital Rights Management. They want it cheaply and easily, and the technology to give it to them that way — AND to pay the artists fairly — exists. Just look at what Radiohead did last year by letting people decide what they wanted to pay for the album, making them an estimated $6 to $10 million. Or see how “Nine Inch Nails make $1.6m on free album” just this month. Both bands turned their noses up at the record companies and did it their own way. And it seemed to resonate well with the fans. 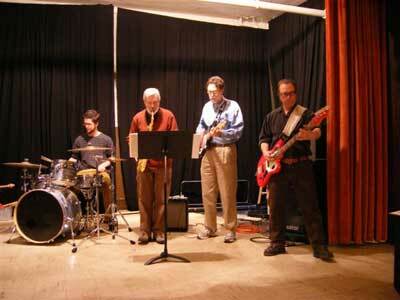 The jazz combo I’ve been playing with at my wife’s church.